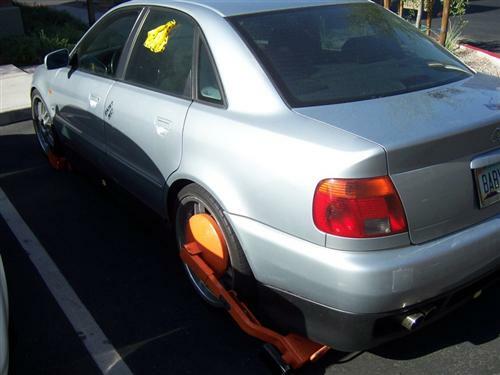 If you haven’t heard yet, there is an epic thread on VWVortex about the guy who got his Audi booted in his own housing development by Arizona Parking Solutions and took matters into his own hands by moving his car with the boots on into his garage via jacks and dolly’s. Brilliant! Unfortunately, the original thread was locked and a new forum, The Parking Enforcement Forum, has been created to continue the diary of this victim’s tale. Very entertaining! Best of luck to the original poster! Previous Previous post: 1988 BMW e28 M5: Euro Conversion For Sale!